These water horses come from a strange land where folks still speak as archaically as they think, dress, and act. They are said to be able to fly although they do not have wings and many have seen hovering above the frothy sea near Moy Mell's Keep to confirm the tale. Their fins are more streamlined and give them the ability to glide through the air above the waves for small distances, provided they swim powerfully from a great depth under the water, breaking the surface with a leap before coasting gracefully along. They appear to love this small power and use it often. 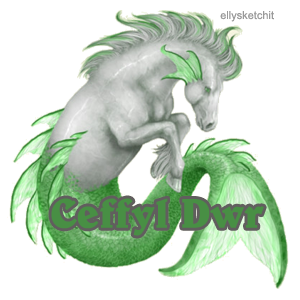 The family is not above playing pranks on the islanders like their kelpie name implies, however, and as sweet as a Ceffyl Dwr may appear to you nickering as it dances about in the playful wavelets near the shore it is wise to leave them alone for the most part. Send anything you don't want back to me, please!